Welcome to the Whispering Winds Weekly! This week as a kickoff for the new format and style I’d like to get back to the roots. The bamboo roots, as it were. If you have been linked here you should know already that we are a community of individuals dedicated to creating a culture of bamboo. If you aren’t familiar with any of this, but we’ve peaked your curiosity; feel free to read on, or check out our website here: WhisperingWindsBamboo.com to learn a bit more about us and get a background feel of what we’re doing here. This “dragon tail” looking object is actually a brand new shoot of bamboo. Freshly sprouted and working as best as it can to reach up towards the sun! Despite its woody exterior and pliable strength, bamboo is a member of the grass family. It is used for everything from building homes to brewing beer, but the most intriguing piece of the puzzle is how quickly it grows. Bamboo is quickly becoming one of the most important elements to the burgeoning green market. The regenerative nature of bamboo makes it more of a renewable and sustainable raw material than trees. While bamboo can grow in just about any soil or climate, its most impressive growth rates require certain conditions. If grown in a slightly acidic soil with a healthy amount of water, bamboo can grow at about 2 inches per hour. On the slower side, most estimates place bamboo at about 24 inches in a single day. Considering that it’s slow pace, and it takes oak trees about 100-150 years to reach full maturity, there is no question that bamboo is a very fast maturing plant. Bamboo only grows when sprouting, and will remain at the same height for the rest of the year. The shooting period for most species is April though June. This “shooting phenomena” is a wonder in itself purely due to the fact that during these months the bamboo has the potential to grow so rapidly, though outside of this shooting season as emboldened above the culms will remain the same height year round. All other plant species has a consistent and uninterrupted growth pattern. The first unique aspect of bamboo is that it can reach its full height and width in a single three-four month growing season. The clumps of new shoots grow vertically in this first season, and do not branch out or flower. Large bamboo species are known to grow upwards of a foot a day, but the majority of standard bamboo species grow anywhere from half and inch to a few inches in a given day. The record for the fastest growth is 47.6 inches in a 24-hour period. 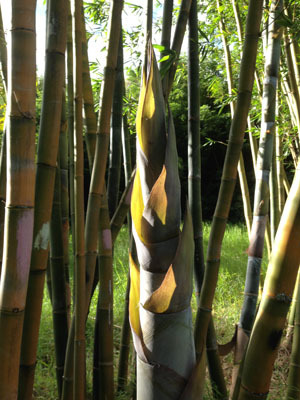 Additionally, there are records of large tropical bamboo plants growing 100 feet in the span of merely three months! In the second year, the outside pulp-like wall of each stem or “culm” becomes dry and hard. The individual nodes begin to sprout small branches and leaves. In the third year, the culm fully hardens, and the bamboo shoot is not considered fully mature. In the standard life cycle of bamboo, fungus and mold begin to develop on the outer culm within the first five to seven years of its life. This is the optimal time to harvest. Within the decade, the fungus and mold will overtake the bamboo, causing it to collapse in on itself, depending on the species. We utilize a specific color marking system, painting each individual pole to tell us how old each of our poles are and what stage of maturity they are likely to be in. Also when they are ready for harvest! Here’s an example of the system at work. After each culm has been given the opportunity to grow and mature, it is ready for harvest. 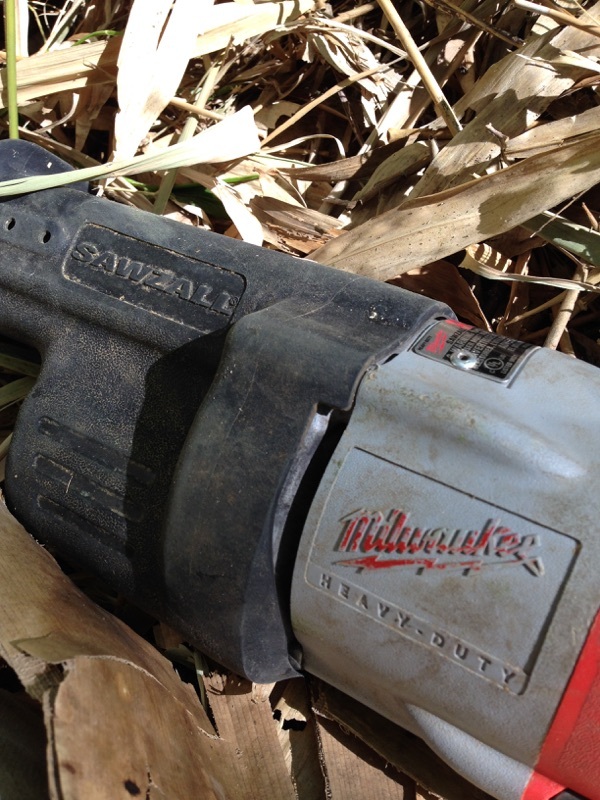 We use Sawzall’s at the base of each pole to obtain the longest possible length. We then remove the top of the pole and set it aside, taking the majority of each pole to be processed in our facilities also on the farm. The photos above are a great examples of a common harvest day. On the left you see one of our crew Gabe using his trusty tool, preparing to bring the mature culm down. Then, on the right Gabe can be seen again but this time with the help of alumni Sam, who looks to be afraid of whatever is about to collapse above them, and “boss man” Rich who is faithfully pulling along down with all his might. Through their collected efforts, and the efforts of the rest of the community we maintain a 20+ acre bamboo forest by harvesting 1-2 times a week. 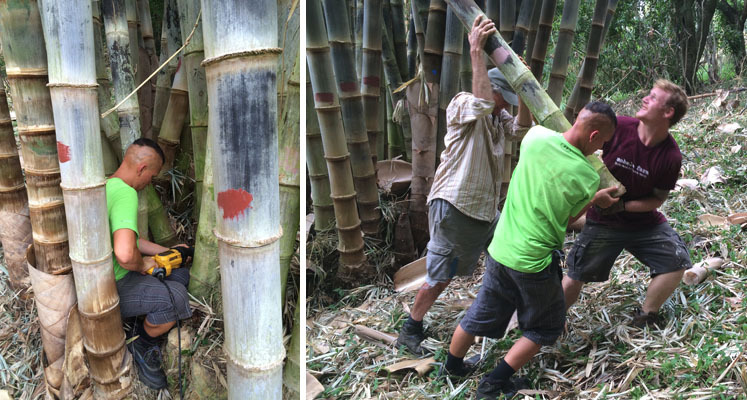 The photo above is the next step in the life of each bamboo pole that is harvested and grown on the farm. Shown is a large drill spinning along a flat surface while the bamboo culm is worked along it, letting the drill hollow out the inside of each culm. 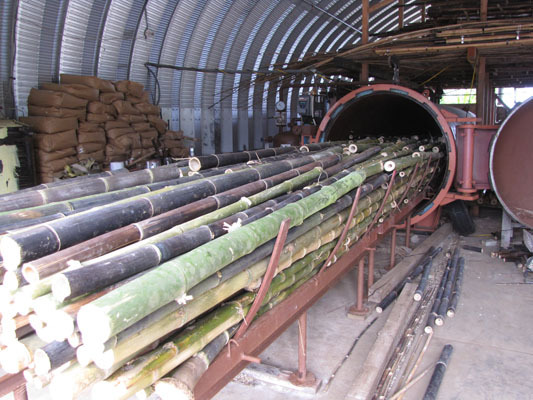 This allows our borate solution our bamboo is treated with to flow freely through the bamboo during the curing stages; as well as keeps the pole from popping under pressure in our pressure vessel. Which brings us to the next and final portion of our process. Our pressure vessel seen in the photo below is loaded with each pole once it has gone through the drilling stage. The chamber itself is 30ft in length, and still fails to handle some of our beefiest poles. 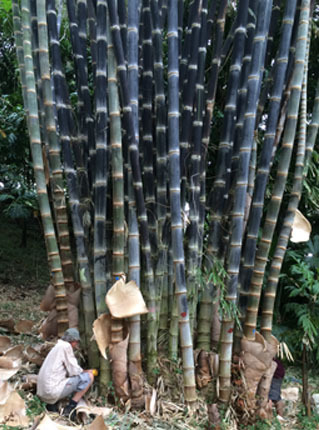 It is then pressurized with a borate solution to help lengthen the quality and life expectancy of each bamboo culm. This solution also helps to treat and discourage the infestation of different insects. The poles are then removed and stood on end to drain of the borate and to dry (cure) for at least a months time. This is when the bamboo will turn from a natural green color to a light blonde. The culm will also shrink slightly as it dries. They are then stored and awaiting further influence to be used on future kit structures, houses, and projects! Here’s an example of one of our storage units! This has been a short and to the point explanation of the life of each bamboo pole as lived on Whispering Winds Bamboo farm, in Maui. Check back in the coming weeks for future updates and insights to how living a sustainable lifestyle can be achieved, the farm goings-on, and inside looks to the daily lives of the community that the farm is built around. Support Sustainably Harvested Maui Grown Bamboo! 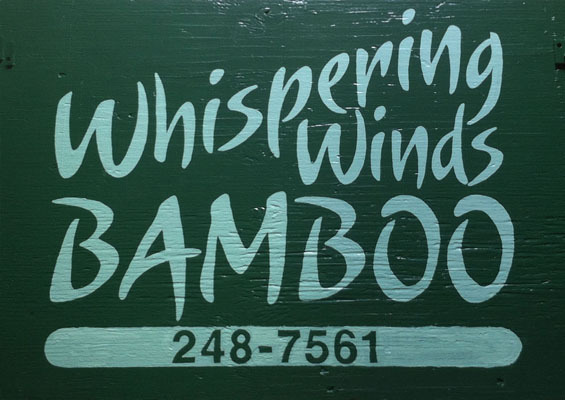 For more information about Whispering Winds Bamboo Cooperative, our products, plants, or programs, please give us a call at (808) 248-7561. Great newsletter! Nice, easy explanation of the process. How about showing people the whole farm,the different “departments” or jobs and who does them? For instance, I know there are gardens that provide food for the workers, and perhaps for market as well. As well as a wonderful kitchen and eating facility. It would be fun to know about that. And how about the mechanical maintainance shop? It would be great to know the people that work there, sort of a personal intro to them. And as you have introduced the personnel, what about highlighting any new personnel? Like the new mechanic and intern trainer, Seth and Jade, and their adorable son Maceo? Of course, that’s my son and his family, ha ha! But really, I think it would be great to highlight the “people of the farm” and show all the various jobs they do, sort of a microscopic look at their daily work. Aloha, Carolyn! Thank you so much for your reply, as well as your suggestions. I am pleased to let you know there will be much and more as to what you were requesting. 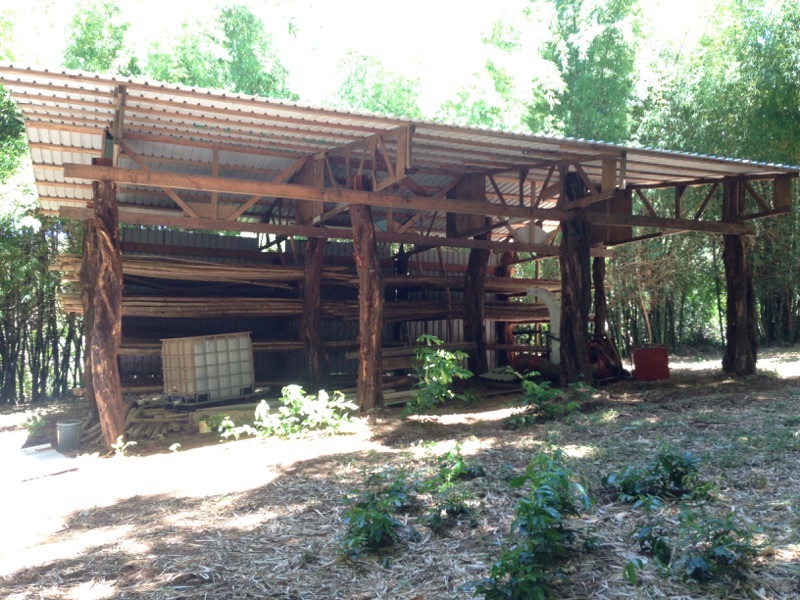 Each section of the farm, its inhabitants, as well as an update on some of our day to day projects are to be included. Which means there will most assuredly be sections in the coming days on those fine folks you mentioned. I hope you continue along on this journey with us and enjoy the blog! Great explanation of everything, and very well written! Now I see the full picture, with a written summary too. I also like the idea of a weekly letter and more info about everything that goes on in the hardworking community of * The Whispering winds farm! Thank you, Franchesca! It is totally a fun project for us to undertake here that we’re all excited about. We’ve definitely got a lot of passion for what is going on here and we are eager to share it with those that aspire to or are seeking more info on living a healthy, sustainable, bamboo inspired lifestyle! I highly regard your philosophy about business and pursuing a sustainable, healthy lifestyle. Thank you, Holly! I appreciate your feedback. We will be publishing future updates on a regular basis. There will be a post specifically about Mitch as well as other alumni who have come to the farm in the past!